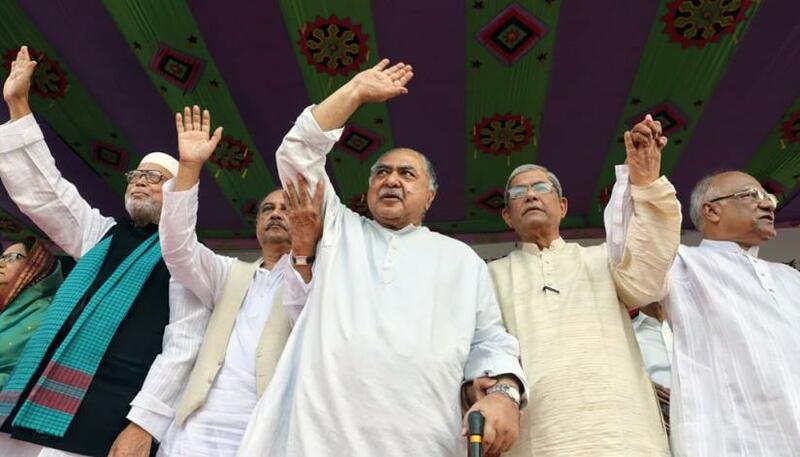 Gano Forum chief Dr Kamal Hossain-led Jatiya Oikya Front, which includes the BNP, will unveil its electoral pledges on Dec 17 and has postponed its Dec 10 Dhaka rally. The coalition’s spokesperson and BNP Secretary General Mirza Fakhrul Islam Alamgir made the announcement on Thursday (Dec 6) after a meeting of its steering committee at Dr Kamal’s Motijheel offices. Earlier in the day, BNP Senior Joint Secretary General Ruhul Kabir Rizvi announced plans for a publice rally and said that they have written to the authorities seeking clearance to hold the rally at the city’s Suhrawardy Udyan. Responding to query on negotiations between allies over seat sharing, he said that the matter was discussed before adding that it will be finalised “within a day or two”.